With so many entrepreneurs and small business startups emerging in the business world in the past few years, it is no surprise that coworking spaces have become popular real estate. With dramatically lower overhead costs and the advantages of a social and professional workplace, coworking may be a great fit for your business. Freelancers and small firms in every business category can enjoy a professional and functional shared office space. With all the features of a traditional office without the start-up costs, a work-from-home business can easily take advantage of a coworking arrangement. You will only be paying for the room that you need instead of the expensive leasing costs and setup fees of a traditional office. Whether you are just looking for a small desk space or a private office suite there is a perfect spot out there for you. 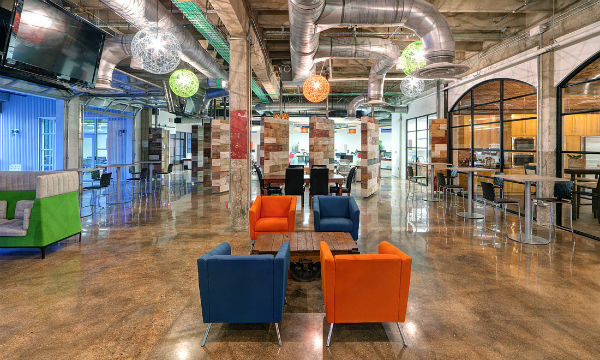 The benefits of shared office space may surprise you. With the opportunity for networking, collaboration and surrounding yourself with like-minded professionals, there are many advantages to a coworking environment. Starting your own business can be a labor of love but can also leave you feeling isolated from the rest of the business world. Trying to keep costs down by working from home is a great way to start, but eventually you will want to branch out a bit. In an active coworking space you can enjoy social interaction with other professionals, have a free exchange of ideas with others in your field and even gain inspiration. Coworking spaces are leased out to countless types of businesses and freelancers. You may be able to make important connections with others in or out of your field that can be to your advantage. Meet with writers, web developers or programmers that may be able to help you advance your own business. Collaborate onsite in a coworking space with professionals in a variety of fields. If you are considering leasing or buying your own private suite of offices, cost will be the most important consideration. You can expect to pay by the square foot and then take on all of the startup costs of getting your space properly equipped for your needs. In a coworking space, everything that you would expect from a traditional office is already provided for you. Computer hookups, phone lines and copy rooms are ready for your use with only one rental payment due per month. No need to worry about utility payments or additional bills and fees that come from leasing your own independant space. Developing a trusted and reliable brand is an important part of creating your business. For things such as business meetings, investment information and client entertaining, having a more formal environment to meet in can make a great impression. In a coworking space you can have a professional work and meeting space that can add credibility to your brand. You have worked hard to start your business and your should have pride in your work space as well as your business image.